One of the first phrases parents hear when a loved one shows symptoms of bipolar disorder, schizophrenia or persistent and major depression is “chemical imbalance.” I remember being shocked when I wrote this term in a Washington Post Op Ed piece and was confronted by someone who told me there is absolutely no scientific evidence that mental illnesses are caused by chemical imbalances in the brain. So I was happy when I received an advance copy of the book: SHRINK RAP: Three Psychiatrist Explain Their Work written by psychiatrists: Dinah Miller, Annette Hanson, and Steven Roy Daviss, who write a popular mental health blog. I found their comments about “chemical imbalances” helpful. 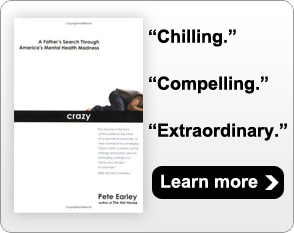 “Chemical imbalance is a term with imprecise meaning…Saying that a psychiatric disorder is caused by a chemical imbalance, although an imperfect explanation, sometimes makes psychiatric disorders more palatable to patients and less stigmatizing. The term gives some credence to the practice of treating these disorders with medication. But there is no psychiatric disorder for which we know for certain which chemicals are “imbalanced” if any. The authors explain that if a person goes to the doctor because of increased thirst or urination and has a lab test done, and it shows markedly elevated blood sugar levels, then that patient most certainly has diabetes. But with a few rare exceptions, such as Huntington’s disease or Jacob-Creutzfelt dementia, there’s nothing like this in psychiatry — no blood test, no x-ray, no CT scan that yields a definitive diagnosis. In psychiatry, blood tests are ordered to rule out medical conditions that masquerade as psychiatric illnesses — especially thyroid conditions or high ammonia levels — or to monitor medication levels to make sure medications are not damaging a patient’s organs. I agree with the Shrink Rap doctors. The term “chemical imbalance” is short-hand used by laypersons to describe what we can’t scientifically explain. We know something is awry in someone’s brain when he/she shows symptoms of bipolar disorder, schizophrenia or severe and persistent depression. We know chemicals often can help alleviate these symptoms. Ergo, we conclude the symptoms are the result of a “chemical imbalance” when the truth is that we don’t really know what is happening, only that something is. I was fortunate enough to speak to Dr. Eric Kandel, the Nobel Prize winning doctor, who appeared on Minds on the Edge when it was produced by Fred Friendly Seminars. Dr. Kandel acknowledged that science simply hasn’t yet been able to discover the “biological underpinnings” of major mental disorders. But our lack of knowledge doesn’t mean a link doesn’t exist, he said. He asked why we continue to separate the brain from the rest of the body when we think of biological illnesses and genetic links. Why do we accept that they play a role in everything that happens beneath our chin but argue that they can’t be influencing our brains? The real tragedy, Dr. Kandel explained, is that medical research in nearly every other area of the body has moved forward significantly with the exception of our brains.